Place a heavenly adornment on your wall using the Ancient Graffiti Metal Celestial Wall Art. 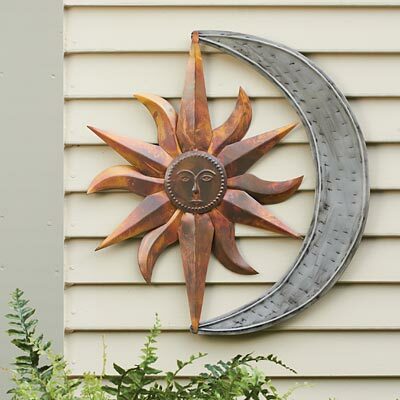 The full sun and crescent moon shape on this item brings a familiar motif to your wall, and its bold colors will surely enhance any setting. Slightly overlapping and creased sun rays emanate from a center disc, with raised spheres and a face here for dimension and personality on the piece. The varying copper hues on the sun shape lend a warm hint to it, while remaining true to the theme. A crescent shaped moon sits to the right of the sun, its silver color contrasting the sun's warm tones. The all metal body displays easily in your garden or living room, and a hanger on the back makes installation simple, requiring only a screw. Bring a bit of the sky to your home with this Metal Celestial Wall Art.